I thought the premise of this book was really interesting, but I’m not sure I bought into the science behind it. There were a lot of case-studies where the removal of symptoms could be related to wheat-removal, but also could be related the weight loss that accompanied the wheat-removal, for the most part. Also, there have been many foods in our lives that have been altered by scientists, and I find it hard to believe that wheat would be the only one that affects us in so many different ways. I was initially interested in the weight loss aspect of this diet, but by the end of the book, I was disappointed with what was presented, because this book is NOT about wheat-removal and weight loss. The diet proposed by Davis essentially boils down to a low carb diet, a late-stage Adkins sort of diet, where you’re allowed to eat as many veggies, meats, cheeses, and nuts as you want, but must limit fruits and non-wheat carbs like rice and beans to very small daily portions. Several non-wheat carbs, like barley and rye, were put on the “never or rarely” list along with wheat, as well as processed foods. I can completely get behind a lower-carb, real-food diet – but I want it to be presented that way. 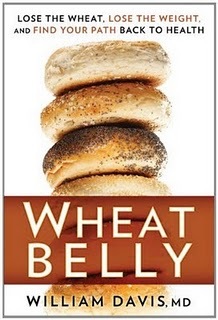 Wheat Belly is not presented that way, and yet, that is what is actually proposing. This book seemed to cater to too many groups, trying to come up with the perfect diet for people with celiac disease, diabetes, pre-diabetes, and those with no conditions at all. Because it tried to cater to all these different groups, it seemed to lose sight of the original premise: that modern wheat is causing damage to our bodies. This is what I was interested in hearing about, but by the time I was a few chapters in, I felt like I’d been mislead. In the end, we were asked to remove all processed foods, all high GI foods, and most carbs in order to be healthy, which is NOT what this book said it was going to be about going in. I would have much preferred a book that focused solely on wheat removal, but instead, the book was scattered and disorganized, as well as misleading. Anyone who says “I don’t like vegetables” is guilty of not having tried them all, the same people who think that the world of vegetables ends at creamed corn and canned green beans. You can’t “not like it” if you haven’t tried it. Begin rant: Well, Mr. Davis…F*** you. Let me just give you an example. I am one of those people who, for most of my life, said “I don’t like vegetables.” It was not, however, because I hadn’t tried them, or because I thought of canned vegetables as the end of my choices. In reality, I had tried many vegetables – and pretty much stayed away from the canned variety – but I could not find any I liked, and rarely found one that I could swallow, under very specific conditions, without triggering an automatic gag reflex/vomiting. See, I have extremely sensitive tastebuds, so I can taste things to a degree that most people can’t. I can taste how many days it will be before milk expires. There are some tastes – like coffee – that are actually so strong I cannot taste them at all, like my tastebuds shut down because they’ve gone too far into overdrive. Vegetables have very strong flavors and scents, and those are difficult for me to handle. To give an example: I can taste iceberg lettuce if it has ever touched my food, even if it was immediately removed from that food. Now, having said that, I’ve spent the last two years forcing myself to learn how to eat vegetables. It took six months before I could eat two servings a day. It took eleven months before a (single) vegetable actually tasted good to me. It took 18 months before I could eat 3 servings a day. Today, I can eat/tolerate more vegetables than I can’t eat, but I still have problems with most raw veggies. Even with cooked veggies, they have to be in peak condition and only cooked certain ways. There are people in this world who really do struggle with vegetables despite real efforts made to eat them, Mr. Davis, and you shouldn’t treat them as if they’re ignorant fools. End rant. So in the end, this book was a big waste of my time. Interesting premise, but the premise is not at all what the book is about. Sad. This entry was posted in 2013, Adult, Prose, Wellness and tagged food, health, nonfiction. Bookmark the permalink.